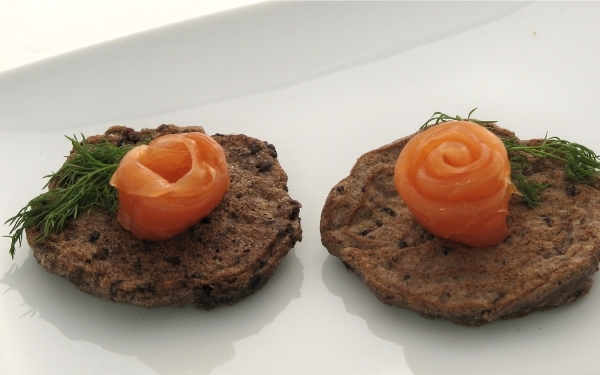 Blini conjure up visions of a posh nosh, usually caviar or smoked salmon and chilled champagne. Making them at home takes serious time while those sold in gourmet stores or on the Internet tend to be dry and tough. By accident, I discovered blini you can make quickly and without advance planning. Plus they are as delicious served on their own as when paired with salmon. It started with egg whites left over from a baking project, plus a bowl of refried black beans. Seeing them both on the kitchen counter triggered the idea of combining the beans with beaten egg whites and cooking the resulting mixture and cooking it in silver dollar-size dollops on a griddle or in a hot skillet. The result is soufflé-light as the mixture puffs into little pancakes with a light crust that make perfect finger food. At today’s multicultural table, these blini are good served with fresh salsa and Mexican crema, as a luxurious nacho. Heavenly topped with smoked salmon, or salmon caviar if you want to splurge, they are also great served with a top-knot of sour cream and a wispy feather of fresh dill. The seasoning in these elegantly light pancakes goes equally well with smoked salmon or salsa. To serve with sour cream and dill, skip the cumin and oregano and replace the chipotle with ancho chile powder. 1. Heat 1 tablespoon of the oil in a medium skillet over medium-high heat. Add the beans, oregano, cumin, and chipotle. Add 2 tablespoons water. Using the back of a wooden spoon, mash the beans until they are creamy, with most of them broken up but some bits remaining, about 2 minutes. Season the beans to taste with salt and pepper. Set aside to cool slightly. 2. Beat the egg whites until foamy. Add a pinch of salt, and continue beating until soft peaks form. Fold in the black bean mixture until it is evenly combined with the whites, making a soft, fluffy batter. 3. Heat 2 teaspoons of the remaining oil in a large skillet over medium-high heat. For each pancake, drop about 2 tablespoons of the bean mixture into the pan, making six at a time. Cook until well-browned on the bottom, about 2 minutes. Turn and brown well on the second side, 2 minutes. Set the cooked bliny in one layer on a warm platter, or serve as soon they are cooked. After the second batch, add the remaining oil to the pan. 4. Serve topped with smoked salmon, sour cream and dill, or fresh salsa. To reheat, place the bliniy in a heated dry skillet, turning them once.